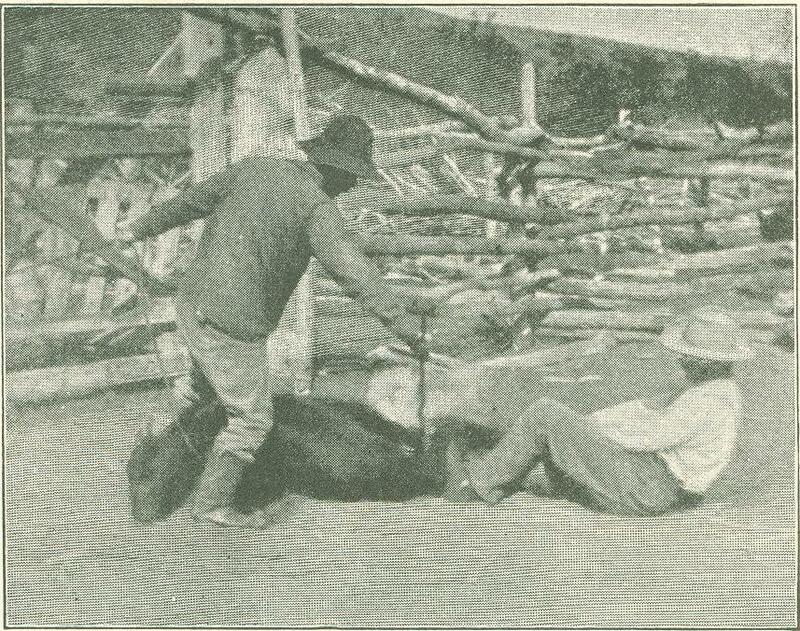 A complete description by an acknowledged expert, illustrated with photographs showing how this peculiar weapon - which is so indispensable on the great cattle-ranches of the Western States - is manipulated. With many curious and interesting facts. 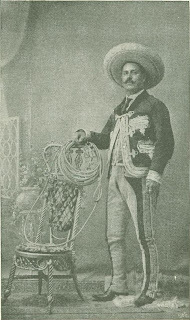 Perhaps the most picturesque and romantic characters of the recent war between the United States and Spain were the Western cowboys, formed into a regiment of cavalry variously known as Roosevelt's Rough Riders, Teddy's Terrors, and other like euphemisms. The fact that the bulk of the command was composed of superb horsemen, familiar with the use of that unique implement; the lasso, caused at the time a variety of state­ments in the Press regarding the potency of the "rope" as a weapon – statements - which were amusing to anyone like the writer familiar with the article in question. For instance, one recent statement in a New England paper implied an effective range for the lasso of something like 100 yds; while in the most sensational sheets there have been vivid illustrations of lasso charges against massed Spanish troops! As a matter of fact, a lasso is about 49ft. long - seldom exceeding, soft - and out of that must be deducted the amount taken in making the noose and the part which is retained in the hand. Thus it is seen that the average cast is about 25ft. or 30ft; and the "roper" who can throw anywhere near soft with accuracy is a rarity. In California they sometimes use a rope as long as 65ft; but there they seem to have a habit of throwing an enormously large loop - much larger than is really necessary. 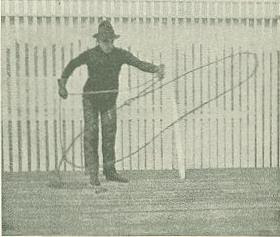 In actual work, however, it will be found that a man's hand is not large enough properly to hold much more than 40ft of rope when coiled ready to throw. The lasso is a creation of a certain environ­ment and need. Its place is on the broad prairies and grazing lands, and its chief utility lies in the stock business. It is almost useless in a wooded country by reason of the obstruc­tions afforded by branches and bushes. The lasso seems to be a weapon of the chase peculiar to North America and the outcome of an aboriginal need. Savages all seem to have weapons peculiar to themselves—as, for example, the Australian boomerang, the Papuan blow-gun, the Zulu assegai, the Indian tomahawk. 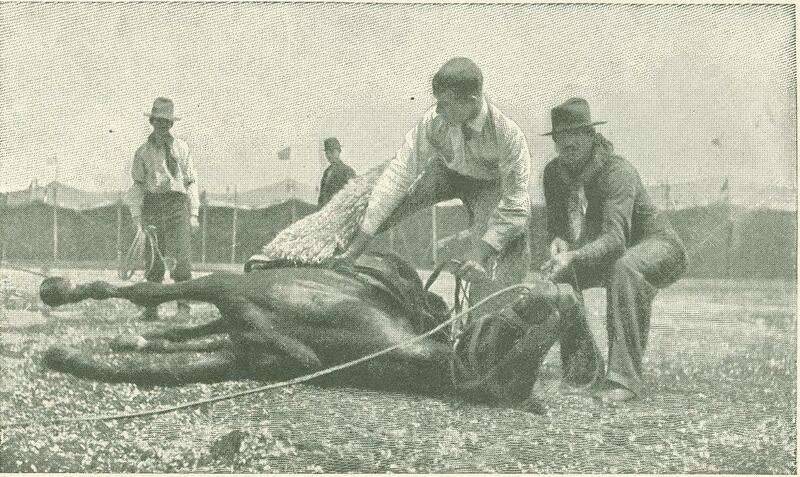 Again, in South America the Gauchos use the bolas for purposes similar to the lasso, and with equal skill. 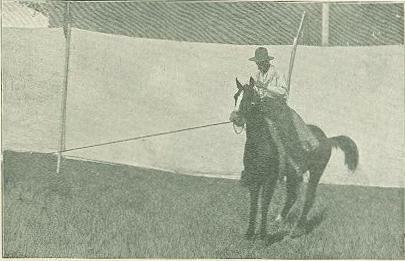 The finest lassos are of raw hide, cut into thin strips and braided, six ply, into a rope of from 3/8 in. to ½ in. diameter. They are quite expensive, a good 40 ft rope costing about 7 dols. On this account, of late years a fine, hard-twisted grass rope is used; but the raw-hide rope is the best in a wind, as it is heavier, and when filled with oil it is not affected by wet weather. A braided rope, also, has less tendency to kink than a twisted rope. 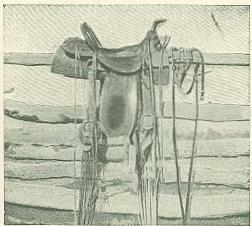 Cowboys have a mixture of lard and beeswax with which they dress their hemp or linen ropes to keep out dampness, and also to prevent them from getting too dry. The most celebrated make of the genuine "riattas" are those made by the Raw-hide Manufacturing Co., of Chicago, who produce an article much superior to the rougher ones turned out in Mexico. There are three general methods of throwing, with many minor variations of individual habit. The rope is held in practically the same way in every case. First is the plain, straight cast, noose swinging around above the head from right to left, by a rotating wrist movement. 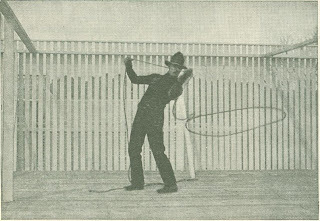 Some "ropers" throw a small loop, hard and fast, almost on a level; others a larger, lazier kind, which nevertheless "arrives." For my­self, I rather favor the small loop thrown hard, as it seems the best all-round style, most effective against the wind or other adverse conditions. The aim is somewhat to the right of the object to be roped - say, a foot and a half on a s5 ft throw; the exact instant of release being governed by weight of rope, wind, velocity of swing, etc. Judgment comes instinctively with practice. The rest of the rope is held coiled in the other hand and released as fast as desired, two or three coils being retained. To ''snub'' the rope (wind it about the pommel after casting) in the instant of' time allowed, is a trick quite as difficult as throw­ing properly. The Mexi­cans with their large-diameter pommels only have to take one turn; the American pommels being smaller require two. The pommel often smokes from the friction created, and is frequently deeply grooved and almost burned by the rope. The important part played by the trained cow-pony is obvious. He is taught to settle back on his haunches the instant the rope begins to tighten, and in many other ways materially to assist his master. The second method of throwing is exactly the reverse; i.e., the noose is swung from the left to right above the head before release. This is called the "California Throw," and possibly gives a little greater range. At any rate, one or two of the longest throwers I know use it, and I find it so myself. It may be only a personal result. Any good "roper" can throw either way. The third cast is the "Corral Drag," which, as its name implies, is for use afoot and in confined quarters. It consists in trailing out the loop on the ground behind one, and snapping it forward by an underhand motion. From the foregoing it will be seen that a lasso charge against massed and unshaken troops is impracticable and absurd. The men would have to ride up to within 40ft of a line of armed men, cast ropes and whirl their horses to right or left, and then race back again. They would have to be deployed so that their ropes would not strike each other while being whirled, and the attempt to wheel might result in inextricable confusion. At five times the distance, armed with six-shooters, the fine marksmanship of the plainsmen would be infinitely more deadly and decisive, until the enemy were on the run. On broken or panic-stricken troops, either infantry or horsemen, the lasso would find a special and peculiarly effective field; and a squadron of "ropers" turned loose on a demoralized and scattering enemy would scoop them in at an amazing rate. But where the lasso comes into contact with firearms, it must make the swiftest kind of retreat. Where the adversary is un­armed, or only has a knife, it is an entirely different matter. The lasso's greatest effec­tiveness, as a weapon, is when the wielder is mounted. When both ad­versaries are afoot its value is very slight. With cattle or horses it is an entirely different thing. The whole essence of the matter is to tighten the noose around an opponent with a jerk sufficient to dismount him or take him off his feet. To that end you may ride past him, swiftly, or, if pur­suing him, stop your own horse suddenly. Or if he is stationary and you can­not ride past him, you can wheel your own horse and retire after a successful cast. In lassoing a man, if done skillfully, the instant of time is too brief for him either to throw off the tightening noose or cut it. And it is one of the most deceptive things to attempt to dodge. CHAMBERLAIN, S.D., Jan 20. — Miss Eliza Walker, who owns a stock ranch a few miles north of this city, to-day brought in the scalp of a large grey timber wolf, and the story of its capture by a lady is interesting. All the fall Miss Walker has been troubled by this wolf. It appeared to make its head-quarters in a small ravine, filled with timber, about a quarter of a mile from her house, and from this point it sallied forth in quest of food. A short time ago it killed a young steer belonging to Miss Walker, and several neigh­bors have lately suffered similar losses. Miss Walker states that towards evening, as she was out on-horse­back rounding up her cattle for the night, she dis- covered the wolf in the very act of making an onslaught upon a young calf in her bunch. Her only weapon of offence was a rope attached to her saddle, and she concluded to make an attempt at roping the animal. This she succeeded in doing at the first attempt. She then started her horse on a run, and after she had exhausted and subdued her capture in this way she permitted her dogs to finish the job. Although not explicitly stated, the lady in question undoubtedly rode astride, on a regular stock-saddle, as is quite customary for women in cattle-raising localities; and she dragged the wolf from the pommel in most approved style. 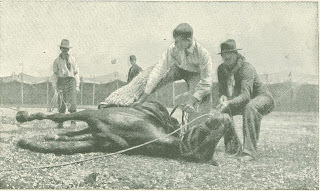 Cowboys frequently ride down and capture mountain lions in this manner; and three or four of them together have even succeeded in taking a full-grown grizzly bear - an animal of such strength and ferocity, as to be hunted only with the same caution as is observed in the case of a tiger. It is possible to control the noose of a lasso by the remainder of the rope, but it is a dexterity which few acquire in years. 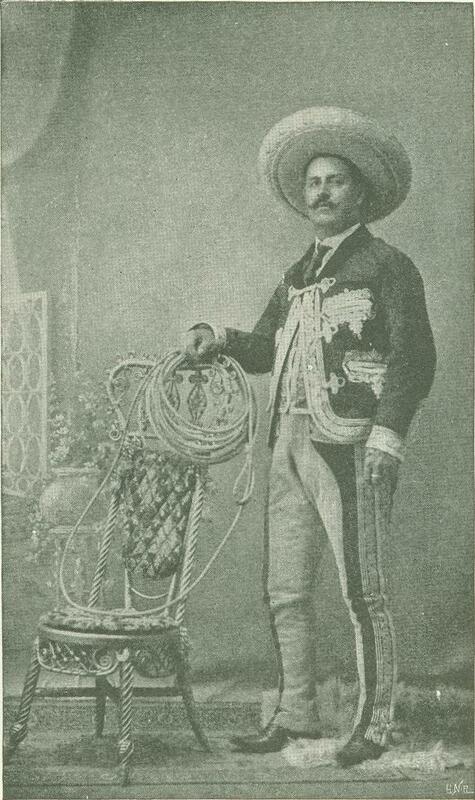 The finest roper I know, Vicente Oropesa, champion of old Mexico, who is with Buffalo Bill's "Wild West," can do this to perfection; and his per­formance is one of the ablest things in that interesting exposition of plainsmanship. Oropesa is an enthusiast. One of the Mexicans once told me that one night the champion dreamed of a new cast, and at once got up and went out scantily clad, and in half an hour had mastered it. In spinning the rope I have been accused of sticking or securing the "honda" or slip-noose from sliding; but in reality it is perfectly free to move along the rope. In fact, I can readily start spinning a noose 2ft. in diameter and increase it steadily to 8ft. or l0ft across. 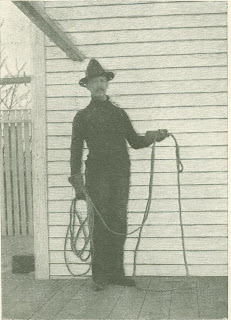 A peculiarity about roping horses or steers is that after getting a hard fall a few times they quickly get "rope-sense." I have often seen them, in a corral, stand stock-still when the rope falls across their backs - even when, as a matter of fact, they are not caught. If any reader has ever encountered a clothes-line while running at full speed in the dark, the line stretched at about the level of the throat, he will notice that he doesn't run across that lawn any more after nightfall. He's got "rope-sense," in fact. There are several uses which the lasso could be put to it seems to me, even in quite densely populated districts. In capable hands it would afford an excellent means of stopping the many street runaways, and it also could almost always be utilized where a skater broke through the ice. And as a regu­lator of fast bicycling it would easily stand unrivalled, for no scorcher would dare to ride past a guardian of the peace equipped with the persuasive lariat. As I am left-handed, I handle the rope in a manner precisely the reverse of the way which I have described it. In picking out and roping any particular leg of an animal while in motion, I cannot analyze the method. I commence whirling the noose while watching the foot rise and fall, and when the instinctive feeling comes of its being the right time, I let go. The Mexicans generally use a larger "eye," or more open "honda," for the slip-noose than do the Americans. The latter use the rope a good deal in branding calves, and require a small "honda" to allow the noose to close quite snugly on the slender legs of these little animals. 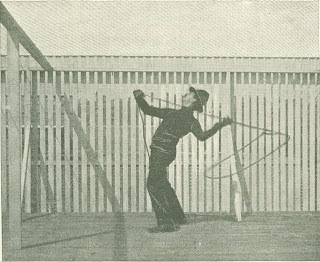 The spinning of the rope, of which four photographs are shown, gives great practice in acquiring general accuracy, and is also useful in catching animals by the feet. It also gives a certain amount of control of the noose after it has left the hand (by mani­pulating the remainder of the rope), which those who have not had this practice do not attain. What little practicing I do is with a short rope, only 25ft. long, simply because it is easier to keep clear of kinks and tangles. I have only shown the plainest and simplest forms of rope-spinning. From this foundation many elaborate and interesting feats are possible, such as spinning oneself into the center of the loop, jumping in and out of the circle, etc. I recently spun and cast my rope in a very moderately-sized room, which fairly bristled with bric-a-brac and costly ornaments, without doing any damage whatever; though I fancied my hostess looked a trifle relieved when I had ended the performance.